The Mark 39 nuclear bomb and W39 nuclear warhead were versions of an American thermonuclear weapon, which were in service from 1957 to 1966. The Mark 39 design was a thermonuclear bomb (see Teller-Ulam design) and had a yield of 3.8 megatons. The design is an improved Mark 15 nuclear bomb design (the TX-15-X3 design and Mark 39 Mod 0 were the same design). The Mark 15 was the first lightweight US thermonuclear bomb. The W39 warhead is 35 inches (89 cm) in diameter and 106 inches (270 cm) long, with a weight of 6,230 pounds (2,830 kg) to 6,400 pounds (2,900 kg). It was used on the SM-62 Snark missile, Redstone IRBM missile, and in the B-58 Hustler weapons pod. 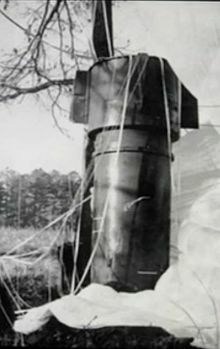 Two Mark 39 nuclear bombs were carried by a B-52 Stratofortress that broke up in the air and crashed near Goldsboro, North Carolina on January 24, 1961. According to Parker F. Jones, a supervisor of nuclear safety at Sandia National Laboratories, in a 1969 report that was declassified in 2013, the Mark 39 bomb had four safety mechanisms, one of which was not effective in the air. On one of the bombs involved, two more safety mechanisms were "rendered ineffective by aircraft breakup." As a result, Jones noted that the bomb was prevented from detonating only by the fourth mechanism, a simple "ready-safe" electric switch. Michael H. Maggelet and James C. Oskins, authors of Broken Arrow: The Declassified History of U.S. Nuclear Weapons Accidents, dispute the claim citing a declassified report. They claim that arm-ready switch was in the safe position, the high-voltage battery was not activated which would preclude charging of the firing circuit and neutron generator necessary for detonation, and the rotary safing switch was destroyed precluding energisation of the x-unit (firing capacitors). The tritium reservoir used for fusion boosting was also full and had not been injected into the weapon primary. This would have resulted in a significantly reduced primary yield and would not have ignited the weapon's fusion secondary stage. A Mark 39 casing is on display in the Cold War Gallery of the National Museum of the United States Air Force in Dayton, Ohio. The bomb was received from the National Atomic Museum at Kirtland Air Force Base, N.M., in 1993. ^ Pilkington, Ed (September 20, 2013). "US nearly detonated atomic bomb over North Carolina – secret document". The Guardian. London. Retrieved September 20, 2013. ^ Michael H. Maggelet and James C. Oskins (March 5, 2013). "Goldsboro - 19 Steps Away from Detonation". Retrieved July 4, 2017. This page was last edited on 11 December 2018, at 12:04 (UTC).